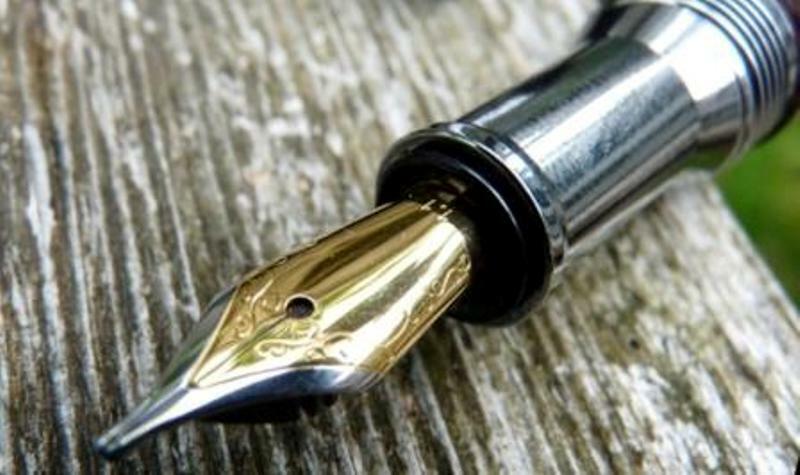 A little bit of history Back in the early twentieth century, there were several great British fountain pen manufacturers, and although debate will rage ad infinitum about who was the greatest, Conway Stewart is usually in most people’s top five or so brands from the period. Like so many famous names of the era, it died a death at least in part due to the ghastly machinations of László Bíró, only to be reborn earlier this century. The reanimated Conway Stewart, based in Devon, could no longer claim to make the ‘all-British pen’ (the nibs were made on the continent), but they certainly turned out a decent range of very attractive writing equipment – ironically including some bodies adapted for the dreaded alternative to a proper pen, but we’ll have to overlook that. The new CS pens were made of a fine range of materials, and this caught the attention of many a fan, but may also have been part of its undoing; lacking an affordable end to its range it was always a high-margin but low-volume business, depending heavily upon exports, and it only took a fluctuation in currency exchange rates for feast to turn to famine. When the reborn brand was wound up last year, a number of enterprising firms bought up machinery, rod stock, and parts for partially-assembled pens, and one of these operators, Bespoke British Pens, has been trickling out a modest but interesting line of cannibalised Conways for the last few months. We couldn’t resist trying one out. How it looks Big, shiny, solid and posh. Those resins are hard to capture in the camera, but they do reflect the light nicely and that Conway Stewart nib really sets it off to perfection. The only slight drawback may be the simplicity of the nib presentation, which some of our reviewers felt was a little under-ornamented. The union jack etched onto the nib would have pleased Winston, of course, although he may have raised a wry smile to find that (being a Bock) it was made in Germany. Overall, it looks expensive – which it is, really, but we’ll come on to that later. How it feels Again, big – and fairly hefty. Neither was a problem as far as any of our reviewers were concerned; indeed we all found it sat very comfortably in the hand and felt ready for a good long writing session. Some of these pens – but not all – still have Conway Stewart imprints and limited-edition numbers engraved into the barrel. How it fills It’s a piston-filler. 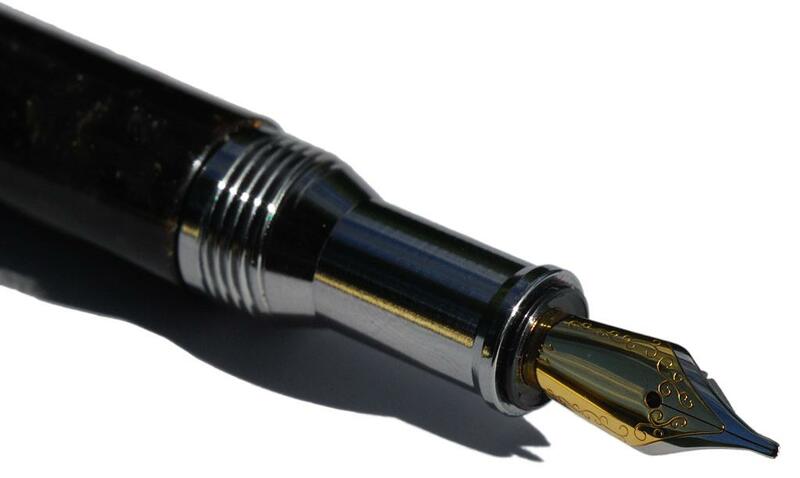 The piston in question is essentially a decent captive converter, so the ink capacity is perhaps not as great as that in one of the bigger TWSBIs, for instance, but it takes on enough ink to keep going for a fair while. 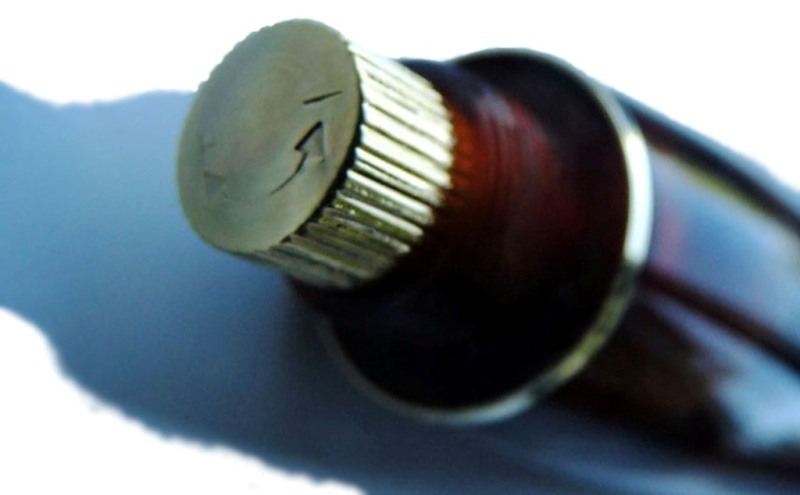 The piston screw is hidden under a blind cap, which would be all too easy to lose – but it does keep the lines of the pen nicely rounded. Crucially, how it writes… Not all the spare parts were available in the same quantities, so Bespoke British Pens soon found themselves running out of an essential component – nibs! They seem to have made a virtue out of a crisis here by getting in touch with the original nib suppliers and procuring a unit with longer tines, which makes for a civilised semi-flex performance. It’s not as noodle-soft as the likes of the Pilot FA nib, so it can be used for everyday writing but there’s a decent degree of line variation available when you want it, without requiring too much effort. Pen! What is it good for? Now, flex isn’t everyone’s favourite thing, and even a rather civilised flex nib like this won’t be too everyone’s taste – indeed, some of our reviewers felt this was a nice pen to play with but really not their bag for keeps. But one of us thought that it deserved a new category: ‘everyday flex’. A serious, big pen with a nib which offers flex but behaves well enough to use for ordinary note-taking and writing is not so easy to find – even if, at this price, you probably won’t want to take it out and about with you often. VFM This is a tougher question. At a ticket price of £450 there’s no getting away from it; this is a very expensive pen. We think the materials, the quality of workmanship and the relative scarcity of materials do justify a premium price, although probably more at the £350 level really. Whether you feel it’s worth such a lot of money is, as always, very much a personal matter; it could be good value if it’s your dream pen, but if it’s not all that then you could get two or three good pens for the same money. Of our test panel, two were happy to play with it and pass it on… and one of us smashed the piggy-bank and bought one! …and if I was married to you, Madam, I’d drink it! If this isn’t quite your cup of tea, but almost… There’s no point splashing out this much if it isn’t absolutely right for you, of course. In truth, the Winston seems to be one of the most popular CS models amongst fountain pen aficionados, but the similarly large Churchill brings a flat-top cap to the collection, and there are several smaller models still available for those who find this a bit unwieldy – all the way down to the diminutive Dandy. If a big, expensive, British pen is on your bucket list but for some reason Conway Stewart doesn’t cut the mustard, Onoto and Yard-o-Led are also still out there – and we’ll get on to reviewing their competing offers in the months ahead if we can find a way to do it. Our overall recommendation Think before you press the button, as ever. Unfortunately there are few opportunities to try this before purchase, so an honest calculation about your own needs and resources is the order of the day. If you like flex nibs and can sensibly afford one of these (preferably without triggering marital disharmony), go for it; this is quite a pen! If flex isn’t really your thing, or you have any doubts about whether you’ll get enough mileage out of this to justify the cost, be careful. Where to get hold of one Other by-products made from salvaged CS components are also available, and if we get our hands on them we’ll review those too. But in the meantime, if you’re after this particular combination with the ‘flag’ flex nib, you’ll need to go directly to Bespoke British Pens. Thanks to David at Bespoke British Pens for kindly lending us a splendid brown Winston for its little tour around Britain. A little bit of history Pelikan are already famous as the pre-eminent purveyors of the smoothly-tuned piston-filler, from the small but perfectly formed M200 to the huge M1000. 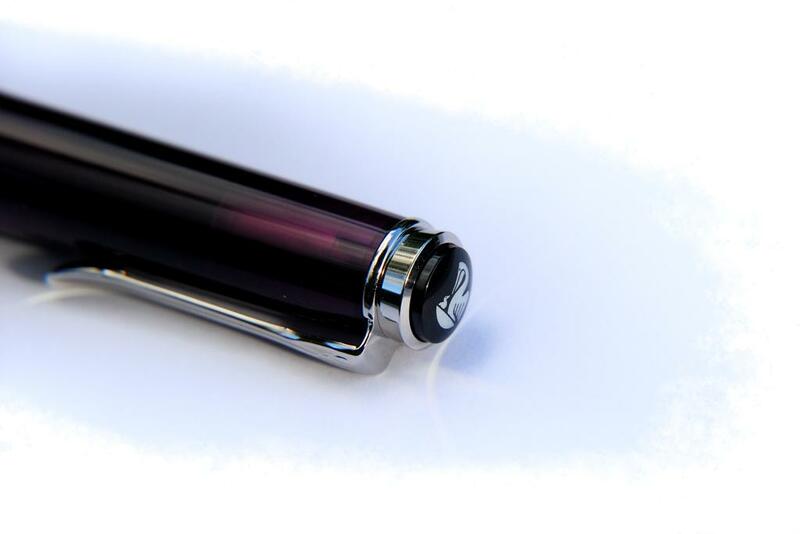 We’d have to get around to reviewing one sooner or later, but Pelikan forced the issue somewhat with one of their limited editions, in a nice dark purple. Be fair now – you couldn’t expect us to say no, could you? Thanks to a bit of help from the very lovely Pure Pens of Pontrypidd (who sell Pelikans – have your guessed their favourite letter? ), we have been playing with two fine examples with very different nibs – but we’ll come on to that in a minute. First, the eye candy! How it looks The sophisticated end of purple, this is a serious amethyst shade rather than brash violet, so any chaps who feel overly protective about their masculinity have nothing to fear. But according to our panel, it also still looks ‘fun’, which is a difficult quality to define, but if it can achieve that at the same time as exuding luxury, it‘s getting something right. The preposterously swanky packaging doesn’t hurt, either. How it feels It’s a shapely pen which feels like it’s built to last a lifetime, and probably will. Whether it’s the right size for you is quite a personal matter – this is the smallest end of the Pelikan range, of course. The majority of our reviewers found it just perfect, but one of us found it a bit too small for longer-term comfort – but then again, he thinks Sailor’s ‘King of Pen’ is a perfectly sensible size. There’s no accounting for taste. What the M205 definitely doesn’t feel, however, is cheap. How it fills A piston, obviously. 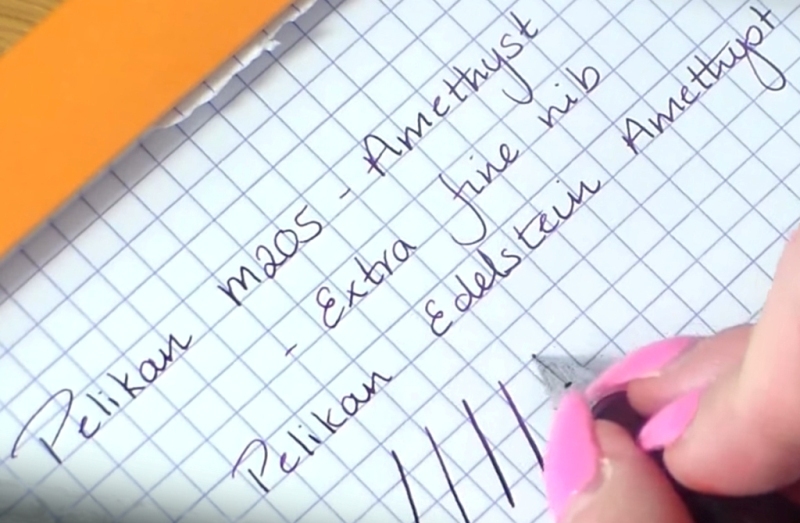 Until TWSBI came along Pelikan pretty much monopolised the piston-fill market, and they do it well. The actual ink capacity is not earth-shattering, but it still opens more options than reliance upon over-priced cartridges would do. The piston itself is smooth and authoritative in action, and doesn’t feel like it’s going to let the user down any time soon. Crucially, how it writes… Very well indeed. But exactly how depends upon your choice of nib, of course. 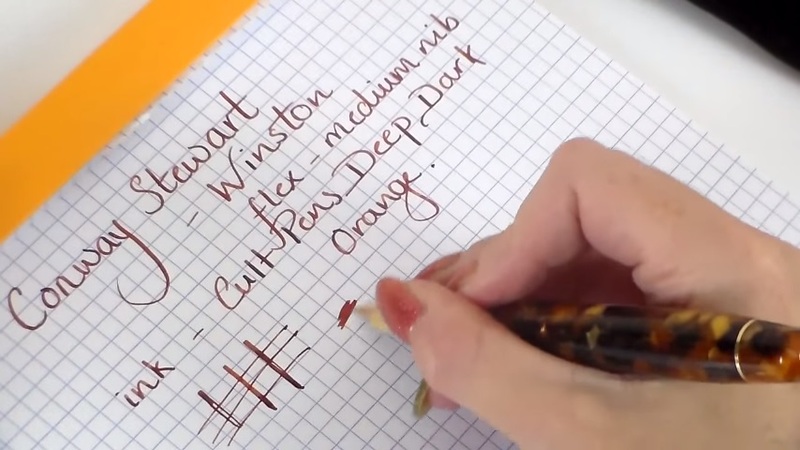 Ruth was most impressed with the smooth but surprisingly generous steel EF nib, and you can watch it gliding suavely over the page in her video (links below). Scribble and Stuart opted for a ‘stub’ italic nib personally ground-down from a BB nib by Ross at pure Pens, which retains a little bit of spring and is a nib full of ‘character’. Either way, using this brings a bit of a smile, somehow. Pen! What is it good for? With a ‘sensible’ nib in, you could probably just about get away with taking this to work – although in this case it may depend upon your profession! On the whole, this one’s probably a nice one to have safely wrapped in a pocket or hand-bag for when you need to scribble a few notes while out and about. 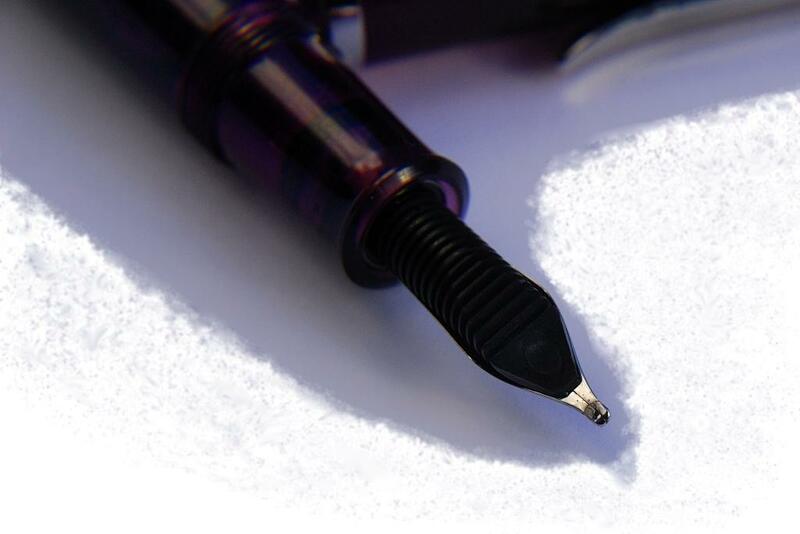 Longer-writing sessions may be possible too, for scribblers with smaller hands. VFM TWSBI do a similar job as the M200 for half the price, so the unusual colour and trim of the M205 goes some way to justify the premium price of the Pelikan in this case. It really does look better in purple and chrome! 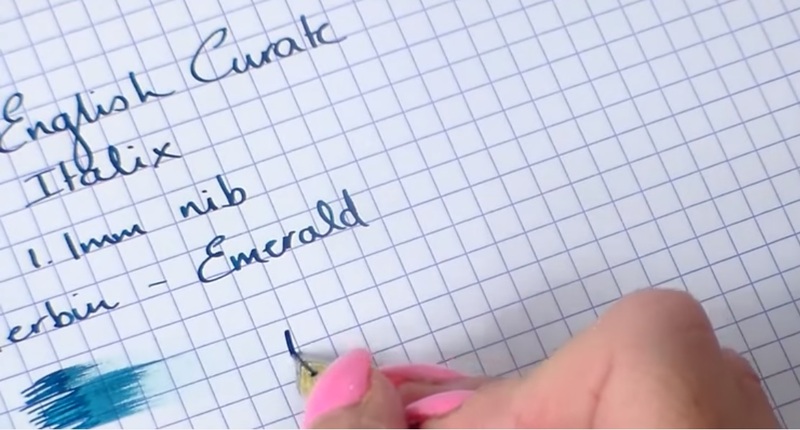 It’s not a cheap pen, but if you are after a special nib (like that ‘Cymrucised’ italic) and you want it connected to a proper piston system, this is a good choice. Our overall recommendation This one’s ideal if you feel like treating yourself to something unusual without completely smashing the overdraft limit. If you like to have fun with proper pens rather than only thinking about office-work and calligraphy, and if you like purple of course, get one. Where to get hold of one As they helped us get hold of two of these smashers to review, we’re naturally going to name-check Pure Pens here – and if you want that specially-ground italic, their pelikanpens.co.uk subsidiary is literally the only place to go. 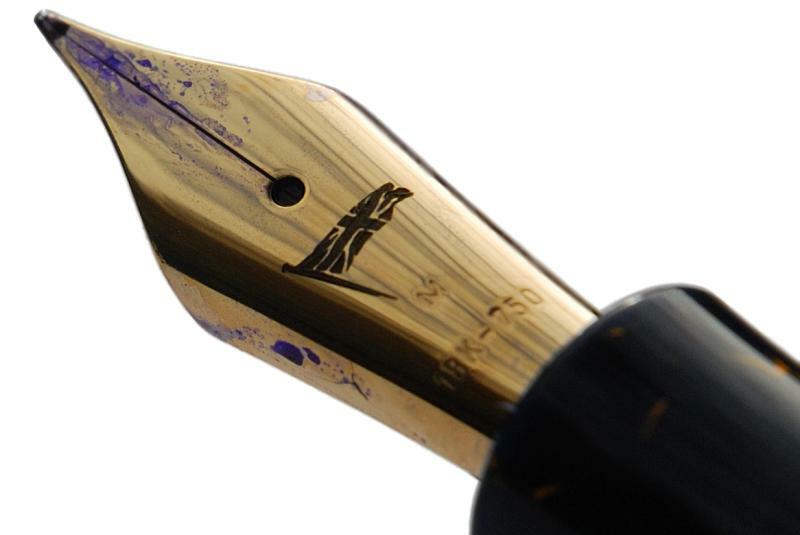 Other specialist fountain pen retailers including Cult Pens and The Writing Desk also stock the purple M205 in the UK, and at the time of writing it’s £90 at all of the above for one of the standard steel nibs. …and now you want one too, eh? Thanks to Pure Pens for pulling out all the stops to get a couple of review samples into our paws. By the way, if you’d like to see what this company offers, orders over £10 will be getting a 10% discount for the next few weeks for United Inkdom readers – just use the code “UNITED10” (all capital letters) and enjoy!